“The angels want to relieve you of the burden of worry by giving you a physical method for releasing your cares to Heaven. Writing down your prayer requests or worries for Divine intervention is an effective way to work in partnership with God and the angels. You can write something short or lengthy and will receive the same results. What matters most is that you write from your heart and then “give” the paper to Heaven symbolically either by burning it (which releases it), purring it in the freezer (which stops the situation from progressing), burying it (which helps with emotional healing), or putting the paper in a God Box (see the Action Steps below). God Boxes are time-honored tools for gaining peace of mind and answers to your prayers! If you do not already have a container specifically for use as a God Box, now is the time to buy, make or designate one. This is such a profound and powerful exercise and such an amazing tool to end and start the year with! Today is the last day of 2018, we can breathe a collective sigh of relief. We are stepping into a brand new year! 2019 is going to be a year of, of accelerated learning and raised consciousness. Being a master number 11/2 year, it is to be a year of creativity, passion, joy and clear communication. It is the year to reap the rewards of the seeds planted in 2018 and also to further delve into the energies of authenticity, equality and balance. It is about coming together in new ways, about sharing and creating community. It is about holding space for a new way of Being in the world, of acceptance and inclusion. Take some time to complete the project above, and if you have a partner, spouse, children or a close friend, invite them to join you in your creation. Take a few minutes to meditate first, or at least quiet your mind and do some deep breathing and centering; allowing your body, mind and spirit to come together peacefully. Then start to focus on what it is that you wish to create. Write it out in full beautiful detail, including all of your senses: the sounds, smells, feelings and visions of success, (remembering that we are not going to worry about the “how’s” only focus on what we wish to create). Cut out beautiful photos from magazines, print out pictures from the internet, draw pictures yourself to capture the feelings of your manifestations. As you add each item to your God Box, do so with grace and gratitude. 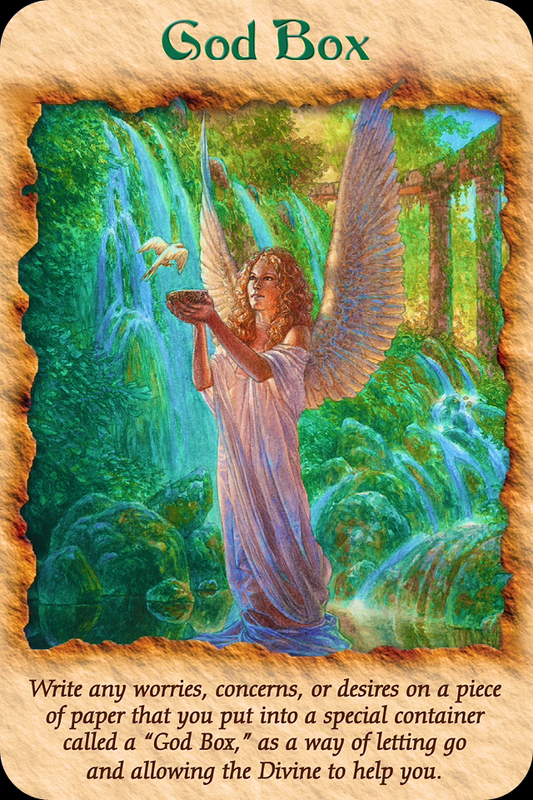 Thank the angels, the Universe, the Divine and your Higher Self for helping to manifest these people, places, situations, material objects and creative projects into your life with ease and grace, for the highest good of all involved. Knowing that they are already on their way to you. When your box is full, hold a crystal (if you have one) in your right hand and fill it with love, asking it to facilitate the speedy manifestation of your dreams. Place the crystal on top of your dreams and close the box. To speed up your manifestation, look through your box every night before bed, and when you wake up in the morning, ask the Universe to show you signs of your dreams coming true. Look for signs throughout each day with positive expectation and gratitude. Add to it any time your dreams change, and keep aiming high. Remember, ANYTHING you set your mind to is possible for you, especially NOW! Be the change that we need so desperately right now. Release all judgment, see the Light in every living soul and your connection to it. As we come together we have the chance to create something new.